George Merritt(goal), Rod Flett(point), Fred Higginbotham (coverpoint), Charles Johnston(coverpoint), Dan Bain(center), Jack Armytage(forward- Captain), Colin "Tote" Campbell(forward), Attie Howard(forward) (Non players unknown). 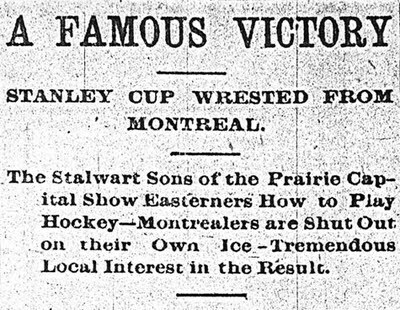 The first east-west match-up in Stanley Cup history took place between the defending Stanley Cup champion Montreal Victorias and the Manitoba Hockey League champion Winnipeg Victorias. On Valentine's Day 1896, Winnipeg defeated Montreal 2-0 behind the goals of Dan Bain and C.J. Campbell and the netminding of G.H. Merritt. 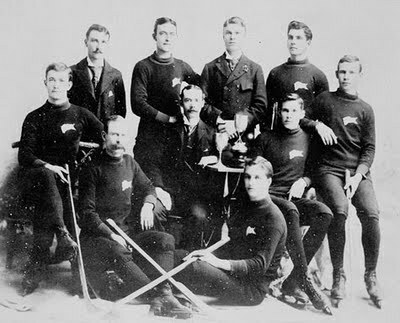 Winnipeg became the first team outside of Quebec to win the Stanley Cup. "This was the first time the eastern men had to submit to a defeat at the hands of comparative babes in the sport of hockey, and yet it was not only a defeat but a complete whitewash." The Winnipeg fans sung their team song over and over: "Hobble Gobble, Razzle Dazzle Sis Boom Bah / Victoria Victoria Rah Rah Rah." Montreal, Feb. 14. -- There is joy in the ranks of the Winnipeg touring hockey contingent to-night. The magnificent Stanley Cup, emblematic of the championship of the Dominion, is theirs. They presented it to the Queen City of the west, as a valentine won as it was on February 14th.